Originally founded as a small design bureau, the Mil helicopter plant outside Moscow has become a world leader in the manufacture of attack helicopters in the last 60 years. Strictly speaking (and not counting Leonardo da Vinci’s 15th-century sketches) it was a Russian who first devised the modern helicopter: In 1908-1911, in Kiev, engineer Igor Sikorsky developed the first prototype of this aircraft type. However, the tempestuous events of the early 20th century determined a very different fate for his early design. After the revolution, the gifted inventor emigrated to the United States, where in 1923 he founded the aircraft manufacturing company bearing his name. His legacy, however, lived on in the minds and workshops of Russian engineers. In the United States, Sikorsky’s company built planes for more than 10 years before it began to embrace this new market niche in aviation in 1939. On both sides of the Atlantic, the multiple benefits of helicopters were quickly understood: They can be used much more widely than airplanes, needing no airfield and able to maneuver at low altitudes and hover in the air. This range of applications opened a vast field in both the civilian and military spheres. In Russia, however, everything had to begin from scratch. Until the 1940s the helicopter was in its infancy in the Soviet Union, but the production of gyros – small rotary-wing aircraft and a prototype of the classic helicopter design – was gradually mastered. Some of the new aircraft even saw service in World War II. A year before the conflict broke out, the first helicopter design bureau was created under the leadership of Nikolai Kamov. However, the true dawn of the industry came in the post-war years, and is inextricably linked with the name of the Soviet aircraft engineer Mikhail Mil. In 1947 at Russia’s largest aviation research center, the Central Aerohydrodynamic Institute in Zhukovsky (the Moscow Region), the helicopter laboratory emerged under Mil’s command. At the time no one suspected that the small unit formed that year into a design bureau would soon be one of the most important helicopter development centers in the world. One year later a bureau employee rose into the air in the first light helicopter designed by Mil, the Mi-1. This was to be the first Soviet mass-produced, multi-purpose helicopter suitable for both civil use (exploration, transportation of people and cargo in remote places, agricultural operations) and military application. The project secured the future of the Mil design bureau, which began to form a new industrial production line with the code number 329, a classification that soon garnered an impressive reputation across the Soviet Union. The Soviet engineers did not stop there. The capacities of the Mi-1 were limited by the piston engine, and work soon began to create a new helicopter gas turbine engine. In 1962, after numerous tests, the new Mi-2 successfully flew, and production began in Poland as well as the Soviet Union. Meanwhile, the bureau was also working simultaneously on the Mi-4 transport helicopter, in direct competition with a similar model built by Sikorsky in the U.S. However, the Mi-4 significantly surpassed its rival’s capacity, being able to convey more than a dozen assault troops in full equipment. The Mi-4 opened up new horizons for the development of air transport, and in 1954 Mil received an order to use it as the basis for developing a heavy transport helicopter, the Mi-6, which went on to set a number of world records. In particular, it could lift a 15-ton load to a height of 8,850 feet (2,700 meters), a record that was long unchallenged. The MI-6 was followed by a series of new aircraft, including the amphibious Mi-14 helicopter, the Mi-10K crane, and the Mi-26 troop transporter, which has the maximum lifting capacity of any helicopter in the world. However, two other aircraft stood altogether in a class of their own. In the early 1960s, the Mil design bureau developed a new model that was classed the Mi-8. It went on to reap 40 years of glory as the workhorse of armies and civilian aviation around the world, with more than 12,000 units built for both military and civil application. The Mi-24 is another unique development in helicopter aviation, and was the first Soviet helicopter built for combat missions. Since 1971, the Mi-24 has seen active service in dozens of conflict zones, from Afghanistan to Angola, the Middle East and the Caucasus. 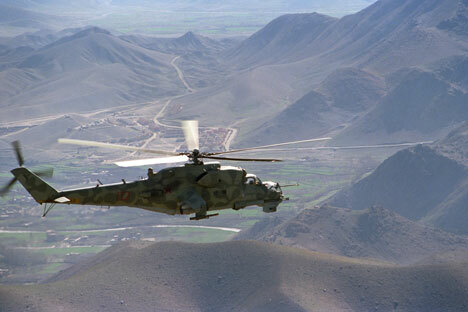 To date, the Mi-24 is the most actively used helicopter gunship in the world, in service with 50 countries. Today, the Mil helicopter plant not only produces and maintains the older models but also creates new ones, including the Mi-28N combat "Night Hunter,” adopted by the Russian Air Force in 2013 and specifically designed to engage targets in darkness. The new Mi-34C, meanwhile, is the only helicopter in the world capable of performing the entire range of flying stunts, while the Mi-38 is an entirely new multi-purpose helicopter design. It is still undergoing testing but has every chance in the future to provide a worthy successor to the stalwarts of the Mil line.